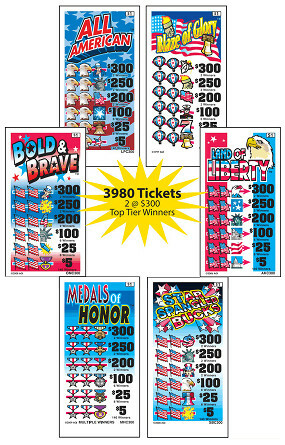 We offer hundreds of different Five-Window Pull Tab Ticket Games, including our six New Patriotic Theme Pull Tabs featuring 3,980 Tickets per deal (game). 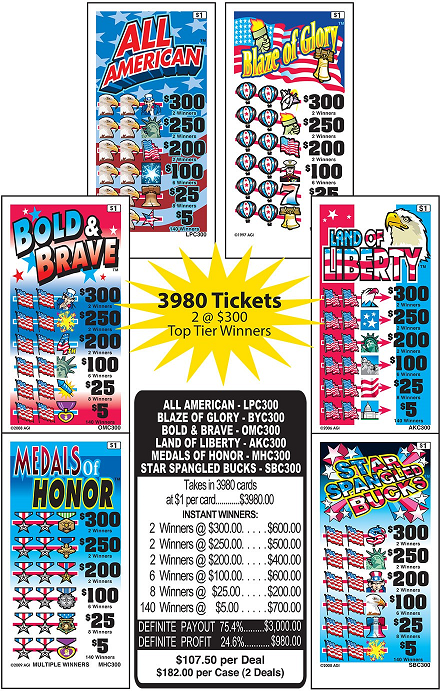 Choose from six different patriotic graphics, including All American Pull Tabs, Land of Liberty Tickets, Bold & Brave Pull Tabs, and Blaze of Glory Tickets. These 3980 series Five Window Pull Tabs have two $300 winners, two $250 winners, and many smaller winners, down to 140 $5.00 bottom prize winners. Looking for other Five-Window Pull Tab Games? Browse our other Pull Tab Tickets by visiting the "More Pull-Tabs" pages listed below. Buy a case and save for all our Pull Tabs!